Workflow Wednesday – Creating Workspaces That Work For You (Part I). Guess what, y’all! It’s Workflow Wednesday and today we’re talking about creating Workspaces. I may or may not have mentioned this when I posted this week’s challenges. Whatever you do, don’t let it get the best of you. Remember, you’ve totally got this! I love having separate workspaces for each thing I do. That’s just how I think. My brain neatly compartmentalizes things into categories. For me, that looks a little something like this. Please keep in mind that this isn’t an all-inclusive list. I’m just trying to give to an idea of what my sorting process might look like. 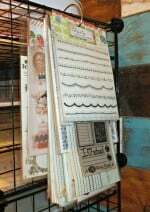 Scrapbooking – Paper, kits and collections, alphas and numbers, stickers, die cuts, and embellishments. Mixed Media & Art Journaling – Art journals, ephemera, paints, inks, stencils, rub-ons, and gesso. Pockets & Planners – Project Life core kits, divided page protectors, and embellishments. Jewelry Making & Metal Stamping – Beads, findings, wire, and metal stamps. Sewing & Quilting – Ribbon, fabric, cutting mats, sewing machine, and patterns. Computers & Cutters – Laptops, tablets, printers, and all three cutters. There’s a never-ending list of ways to accomplish this, but let’s stick with the obvious two. Take everything out or put everything in. What do I mean by that? 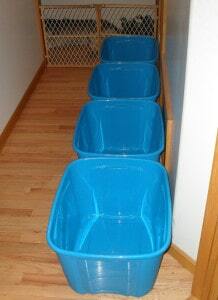 If you’re one of the starting over people, it would probably serve you well to put several Tupperware containers in the center of your creative space. Cut apart the 52 Weeks Printable Workspaces Worksheet and tape each category to one of the containers. At that point, start sorting. I’m sure one of us will come find you if we don’t hear from you by the end of the week. If you’re one of the starting from scratch people, cut apart the 52 Weeks Printable Workspaces Worksheet and tape each category wherever you’re wanting that workspace to be. At that point, start sorting. One thing, though. You’re probably better off to wait until you have an idea what makes sense before you buy anything for your brand-spankin’-new creative space. 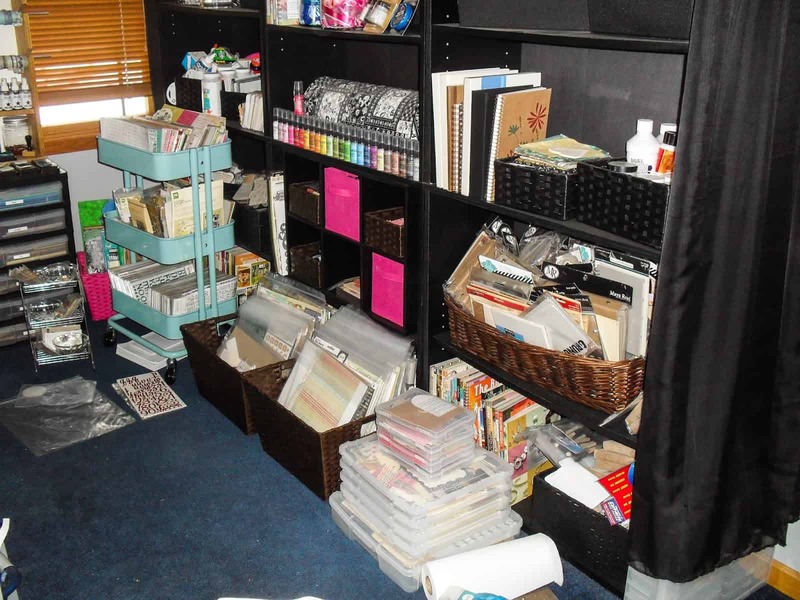 Are you incredibly overwhelmed with the idea of sorting your supplies? Here are a few ideas to make it feel a little less imtimidating. Cover it all up – Toss a few sheets over everything except whatever it is that you’re currently working on sorting. Focus on one workspace at a time and put anything you find that’s out of place in one of the Tupperware containers. Put it in boxes – Box up everything that’s in your creative space and get it out of there. At the very least, box up your supplies, vacuum, wipe off your workspaces, and start over again. You might want to rearrange while you’re at it. Here’s the thing, though. You have to commit to this process. That means touching each and every item in your creative space and making a conscious decision whether or not you want to keep it. If you’re headed in this direction, make sure you have a few garbage bags too. And one more thing, if if it doesn’t belong in your creative space, get it out of there. We have two more weeks of planning, which means you have a few weeks to work through this process at your own pace. If you’re not starting over or starting from scratch, Part II of Creating Workspaces That Work For You will be more your thing. That’s when we’ll be talking about what to do with all of our already sorted supplies. For those of us who are going through this painstaking process… You can do it! I promise you that. Once you have everything you own sorted (and purged), it’s time to get to work on figuring out how to organize it all. In the meantime, have an awesome week! This post is part of the Creating Workspaces That Work For You mini-series. You can find Part II here: Creating Workspaces That Work For You – Part II. Psst… If you haven’t already, you’re definitely going to want to come hang out with us in our 52 Weeks Facebook group. That’s where we’ll be chatting about the challenges and our creative spaces. Thanks so much for visiting and happy sorting, y’all!